A convenient walk-in shower area is a must for a good bathroom design. Nothing can outmatch the benefits of a quick and energizing shower routine in the morning. That is the way to go for a fresh and clean start of the day. A walk-in shower is a wet area that should be fully tiled and properly separated from the rest of the bathroom space. Porcelain, ceramic and stone tiles are a great solution for any shower area. Mosaic tiles and frieze tiles, on the other hand, can make a beautiful accent and add more detail to the design. 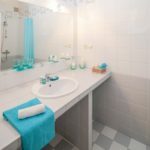 If you want to protect your bathroom from splashes of water coming from the shower area, then you might want to add a see-through glass screen, or at least a half-wall. A walk-in shower area should be appropriately equipped with high-quality sanitary fixtures. You can choose from a large variety of options – shower columns, rail showers with handsets, wall-mounted shower heads, ceiling-mounted rain showers, hydromassage panels etc. All these come in different styles and finishes, so you can rest assured that you will find an option that corresponds to your design preferences. Another thing you might want to consider is creating in-wall niches that are a neat alternative to bathroom shelves. Also, you might want to add a tiled seat or bench to the design. Discover more walk-in shower ideas and designs in the gallery that follows. This shower area features a fixed wall-mount showerhead, as well as a hand shower. Massage nozzles are also a part of the design. They are a great addition to any bathroom – with them you’re in for a spa-like experience at home. Here is another walk-in shower design. This shower area is tiled in grey tiles and white hexagon mosaic. It features an in-wall niche that is a great alternative to bathroom shelves, as well as a corner seat that can be pretty convenient. A rainshower is a great choice for a bathroom. A double rain shower is twice as good. This shower area certainly has it all – a set of two ceiling shower heads, a hand shower and massage nozzles. Here is another walk-in shower area with two shower heads. This bathroom is set in dark grey tiles that give it a private and intimate feel. It certainly is a great addition to a luxurious modern master suite. 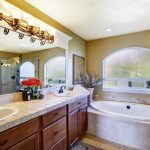 Here is a more traditional design idea for your bathroom. It features a large shower area with a see-through glass screen, which is a great solution if you want to keep the rest of the room dry from random splashes of water. Here is another beautiful design idea. The walls here are set in dark green subway tiles, and the floor is laid with wood-patterned tiles. The shower area is separated from the rest of the space with a clear glass screen. Have a look at a shower area that’s set in brown. It also features accents in light grey mosaic that break the pattern and make an overall monotonous design more varied. The floor is pebble-patterned. Here is another exquisite design idea for your shower area. This one features wood-like tiles and accent mosaic. It is set in warm brown hues that make it feel nice and cozy. It features in-wall niches and a transparent glass screen. Have a look at a highly modern design in all white. This shower area is tiled in white marble that adds a touch of luxury and high class. It also features a see-through glass screen with a bluish tint. Here is another bathroom design with a shower area. Most shower areas are separated from the rest of the space with just a clear glass screen, but not this one – it has solid walls built around it that make it feel much more private and secluded. Have a look at a sophisticated bathroom design in light grey. The floor here is a work of art – it is tiled in a mix of black, white and grey mosaic tiles. The chandelier overhead is another nice touch to the design. This modern bathroom is set in white that inspires a sense of harmony and purity. It features a walk-in shower area with a small window that will let the sunshine in. The shower area is complete with a see-through glass screen. Pebble details in a bathroom are always an eye-catcher that’s why they make great accents. Here they are used on the floor and partly on the wall in this shower area. They add more texture to the design and have a cool natural feel. Here is another contemporary design idea for your shower area. This one right here features a mixed tile mosaic floor and plain dark grey wall tiles. It’s also designed with an in-wall niche for bathroom cosmetics and a glass screen. This shower area is finished with dark brown tiles in a brick pattern. A mosaic frieze makes a great accent that breaks up the uniform pattern. A tiled seat inside the shower area is a neat addition to the design, as are the in-wall niches. This modern bathroom design features a bathtub and a separate walk-in shower area. The shower area has a ceiling shower head and a pair of wall-mount shower heads. It is tiled in beige and brown – two colors that inspire a feeling of comfort and warmth. Here is a design that is beautiful and artistic. It is set in black and white, and it’s rich in pattern and texture. It features white subway tiles with black grouts and patterned floor tiles with intricate detailing. This bathroom has a wet area that accommodates a shower and a bathtub. The pebble floor is a nice touch that makes a great team with the accent stone-clad wall. The copper tub is another fine addition that makes a bold statement. This bathroom design set in white feels clean and simple. It features a shower area with subway tiles and a vintage shower, as well as a clawfoot tub which is a great piece for a design of this caliber. Here is another bathroom design in off-white. It features a shower area with a glass screen and a wood slat floor. The walls are set in large format tiles with a delicate little accent in mosaic tiles. Here is a more unconventional bathroom design set in brown mosaic. This design feels organic and has a nice flow – it features a lot of curves and seems to defy straight lines and right angles. Here is a bathroom design that feels more contemporary. It is set in off-whites and wood, and features a patterned tiled floor in light grey. The walk-in shower area is complete with a tempered glass screen, a window and a rain shower head. This shower area has a sleek modern appeal. It features a half wall with a glass screen and a glass door. Inside there is a ceiling rain shower, as well as a wall mount shower head. The design is set in taupe and beige. Here is a modern double shower design idea. This bathroom is set in beige wall tiles and features a pebble patterned floor. It also has a stone-clad feature wall that makes a great statement right behind the white porcelain tub. Here is more basic design solution. 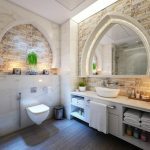 It features a shower area set in plain white subway tiles. That may be a simple look, but it sure is a timeless design that will never go out of style. Here is another traditional design idea. It features a shower area that’s tiled in grey, and bathroom walls that are painted in dark orange. The shower area is designed with a wall niche and a corner seat, and a half wall to separate it from the rest of the space. Here is another interesting idea. This shower area has curved walls that are set in round stone masonry. The entrance to the shower area is quite impressive – with plants hanging overhead, it makes the whole design feel more organic and close to nature. This traditional design features a shower area with only a half wall to separate it from the rest of the space. It is tiled in light blue wall tiles and black floor tiles. It features a niche shelf and built-in chrome fixtures. This modern shower area is designed in beige tiles and glass mosaic accents. It is equipped with black-colored fixtures and a clear glass screen. It also has a corner seat and a pair of in-wall niches. 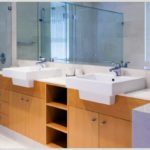 Here is another modern bathroom design. 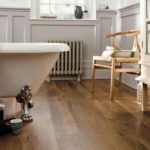 It is set in dark grey tiles that are matched with wood-patterned tiles which are have been a huge trend recently. The shower area features a high-end shower column and a large fixed glass screen. Loved your post very much!